I've been helping a friend with his family history/genealogy over the last three or four weeks. The family I have been helping research immigrated to Argentina during the late 1800s. It's been interesting to see that all lines are actually Spanish - rather unusual. It's been said that Argentines think they are German who are Italians that speak Spanish. The family I've been working on had varying degrees of information linking the lines back to Spain. Some lines had specific towns, while other lines have proved a little more difficult. Over the next few weeks I will discuss the different lines, which come from Salamanca, Galicia, and Asturias, and the different ways I went about finding the immigrants' places of birth. Hopefully it will give you some ideas and additional resources to use. For those of you that don't know Galicia is located in the extreme northwest corner of Spain directly above Portugal. Galicia is made up of four provinces: La Coruña, Orense, Pontevedra, and Lugo. There are four Catholic dioceses in the region as well: Santiago de Compostela, Lugo (learn how to get involved in the Lugo diocese indexing project), Mondoñedo-Ferrol, and Tui-Vigo. The family information that I started with said that one of the family lines came from the town of Guísamo. That was good information, however, family information can sometimes be incorrect. It is a good rule of thumb to double-check the information before you begin searching records earnestly. I started with map sites and also municipal sites (it's a good idea to work with gazetteers or geographical dictionaries too). 1. http://www.pueblos-espana.org - see archived blog post about this site. 2. http://www.mapquest.com - great all around map - great for driving directions too. 3. http://www.viamichelin.com - wonderful map site - very detailed. Here are a couple of sites to help you find municipios and to help you determine record collections. 1. http://www.dicoruna.es - links out to every municipal archive in the province of La Coruña. 2. http://depontevedra.es -find the links to the Municipal archives and the Juzgados de la Paz. The site provides detailed inventories of all these archives in Pontevedra with contact information. Note: I did not use this site during this research session, but thought I would share it anyway - it's too valuable not to. The same type of sites should be used for Orense and Lugo. Using the map sites mentioned above and also visiting the La Coruña diputación site (listed above) I determined that Guísamo was in the municipio of Bergondo. I grabbed the email address to the municipio archive and sent off an email asking two things: 1) Do you have any records in your archive that I could use in my research? I did provide detailed information on what I was looking for. 2) Could you give me the email address to the Juzgado de la Paz of Bergondo? The archivist at the Bergondo municipio archive explained to me that they had census records for the municipio beginning in 1877...and by the way she looked up the family for me. She found the family I was looking for in the 1877 and 1878 censuses. She also forwarded my email to the Juzgado de la Paz, who responded to me via email giving me birth information on four different children. I subsquently sent the Juzgado my mailing address and a few weeks later had photocopies of all the birth certificates the archivist had identified. Note: Spain national civil registration began in 1871. The information in the census records and the birth certificates verified the family information I had been given. The family lived in Guísamo, however, it gave me even more information too. I also got the birth places of the parents of the children and the birth places of their grandparents. This quickly helped me determine where I needed to go to continue the research (not all were born in Guísamo). After gathering all the place information I could from the available records I visited the Santiago de Compostela diocesan archive website (listed above). The Santiago diocese has a neat little search option that allows you to search for any parish in the diocese. I quickly found out that parish records for Guísamo existed, however, they were not in the diocesan archive like most parish records, but they were in the actual parish archive of Guísamo. I did the same thing with the other parishes identified in the census and birth certificates and found that some were in the diocesan archive and others were in parish archives. This information will be helpful when I'm visiting the archives in person, or if I'm corresponding with the archives via email or telephone. I know that I haven't provided a lot of different websites, however, there are plenty out there. Here are a couple more that cover the Galicia region in general that you might find useful. 1. Arquivo da Emigración Gallega - I used this site, however, no one responded to my inquiry. 2. http://foros.xenealoxia.org - forums are always good places to find contacts in the genealogical community. Next week I will discuss how a forum helped me find another one of my friend's family lines in Asturias. I hope that you find these handful of websites useful in your research. Understanding that there are only a few listed here, it should be noted that some of them link out to many more that may benefit you in your research. I should also note that I looked at a lot of other sites, and sifted through many others to find these gems. If you know of any other valuable sites for doing Galicia, Spain genealogy please share them with others in the comments section. thanks for this blog. you've so helped me. This not a comment, but a request for information. Can you post or email me the email address of the archivist at Bergondo. I'm trying to get a copy of my father's birth certificate and other family information. He was born in Bergondo. I'd be happy to send you the contact information, but need your email address in order to send it to you. My 3rd GG (well, I think he's my 3rd GG) was born in Galicia, Spain according to the birth certificate of my 2nd GG. At some point he moved to Portugal. I'm not sure if that was before or after he married his wife. 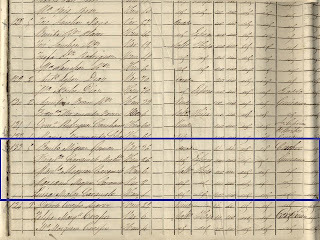 I'm saying I think because my 2nd GG immigrated to the US from Portugal around 1860 and from 1860, his name changed three times -- probably due to census taker error. My 2nd GG died in 1906 with the name Louis P Selby, Sr. Between 1860 and 1900 it changed from Silva to Silvey to Salvey and then to Selby. On a Portugal genealogy message board it was suggested I search for the "p" which could be Pereira, Pedro, or Pimentel. I know that my 2nd GG was born in 1837-1838. In my search, I found a Luis Pinto Da Silveira born in December 1837. His father, Francisco Pinto Da Silveira was born in "Galiza, Espanha". I can't find a birth record. In fact I can't find any other records for Francisco or his wife Florinda Rozas. Florinda was born in Portugal. Would you have any other suggestions for me? I am a member of familysearch.com and I'm able to access ancestry.com via my library website. I've been to our local family search center -- but still no results. Mundia says there are family tree hints for Francisco, but the website hasn't been working the last couple of days. The only information I have about an ancestor is from a birth record of his son born in Portugal. The ancestor in question shows that he was born in galiza, espanha. I don't know the province. I've looked at http://www.apelidosgalicia.org which shows the name Silveira (da silveira in Portugal) was most populous in A Coruna, but that doesn't help much when I'm trying to find exactly which province I should search. The name in Portugal is "Pinto da silveira". When I search with that name, I've found others with that name in Brazil. I suppose it's possible that one moved to Portugal while the other moved to Spain, but I really have no idea where to go from here. Because the way records are organized in Spain, you will never find your ancestor's birth record/baptism record...sorry to be so blunt. Before jumping from U.S. to Galicia, I recommend you find as much information as you can regarding your ancestors in Portugal. For example: do you have the baptism/christening record of your ancestor(s) that were born in Portugal. There records may indicate where in Galicia their father was born in. Also, there should be information regarding emigration from Portugal, but you'll need more information on when he left. Portugal has one of the most complete collections of passport records than any other European country (it's a little scattered, but quite complete). Without having all the details it looks like you still have quite a bit of research to do in U.S. records to determine where in Portugal your ancestors came from - after you discover that information you will have a lot of records to look at to determine where in Galicia their father came from. thanks for this post, it has really helped! I am working with a friend trying to get information on her father's family from Vigo. Her father was only briefly part of her life and she doesn't know the names of his parents. Her father would have been born circa 1925-35. Do you have suggestions on how to work with the archives in Vigo from the US with so little info to work with? Vigo is a big place, and can be even bigger if the name is a common name. Did her father live in the United States? If so, I recommend getting a copy of his death certificate, an obituary, and S-5 social security death application. At least one of these will provide more specific birth information and his parent's names....and possibly more information about them. From that point I would recommend starting to try and track down civil registration records (juzgado de paz/civil registration office in Vigo) and census records, which should be in the municipal archive. I've visited the municipal archive and know that they have census records of the city after 1900. Hello. I am trying to find more information on my mother's family. My great-grandparents emigrated from Spain in the 1930s. My great-grandfather was born in 1898 in La Coruna, Spain. He was married in September(?) 1929 to my great-grandmother (Born 1906). He arrived in the US in January 1930. My great-grandmother was also born in La Coruna and arrived in the US in August 1934. My grandfather was born December 1935. On an application to re-enter the US filed in 1954, she listed her residence as Carnoedo Sada, La Corunna, Galicia, Spain. I have been unable to find any records whatsoever on any family they had in Spain. I'm looking for the birth records of my husband's father. I believe he was born on January 1, probably around 1881 in El Ferrol, Galicia, perhaps in Ares, but I'm not positive. I know the name of his parents, but that's about it. I've tried to research his name on different web sites, but have not been successful. Where could I get information about birth records in that area? Can you help me? Hi, I just found this page and am so happy I did, I know my great grandfather is from Galicia, he emigrated to Puerto Rico, I've found the 1930 census and 1940 census in PR that has his name, he was also the mayor of the town that my mother was born in, back in 1936, I'm looking for information/copies of anything that shows me where from in Galicia he came or when he left. Any clues as to where I can locate this information? Thanks! Hi I'm so happy I found this page. My great grandfather was born in Galicia and emigrated to Cidra Puerto Rico, he was a landowner and became mayor of that town in 1936, I have seen and printed the pages from the 1930 and 1940 Census of PR and saw his name and the names of his first wife (my great grandmother was his second marriage) and their two sons, I'm looking for any information as to emigration records, passenger manifests/logs etc. Any pointers in the right direction would really be awesome. mswings62@aol.com THANKS SO MUCH AND HAPPY HUNTING EVERYONE! You will want to find him, or his wife and other family members, in the civil registration or Catholic Church records in Puerto Rico. The civil registration (indexes) records will be published on FamilySearch (familysearch.org) over the next month or so. I am looking for information on my grandfather, Eustaquio Rego de Martinez. He was born to Carlota Martinez and Vicente Rego on the 19th of September 1893 in Ladrido or Ortiqueira. He had a sister Maria Rego de Martinez born on the 12th December 1897 in Espasante and passed away on the 4th of July 1968 in Ortiquira. Any help is greatly appreciated. My recommendation is that you use this site and see if the government has a record for him in one of the towns you mentioned in your post. If they do they will send it to you and you can use it to piece together your family history.